Cooking can be a hobby, a passion — or for those reading this, a business. It’s one thing to cook in your own kitchen for a few friends. But when you’re a restaurant owner taking on a dinner rush, the chaos can cause frantic decision-making. That’s when things can get dicey. It doesn’t matter whether you run a tiny juice bar or a burger chain, you need a policy that will cover every risk on the menu. Our independent insurance agents will search high and low to find the right coverage to keep your business up and running. 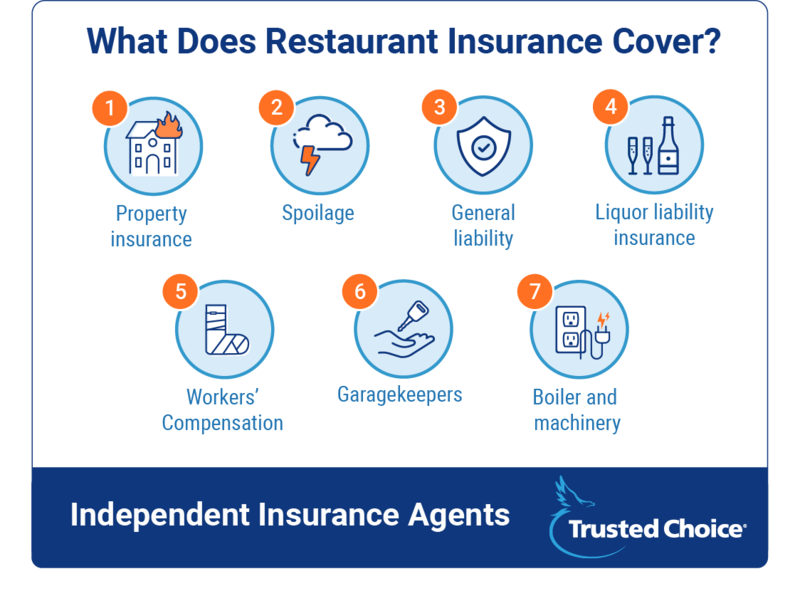 In short, restaurant insurance is a combo platter of coverage that protects your customers, employees, property, and inventory. Every restaurant will have a unique assortment of risks, and your insurance can be tailored to protect your own business accordingly. You could lose your stuff: Damage or loss of your property, equipment, and inventory. You could be sued: A drunk-driving accident caused by overserving a customer. You could make a mistake: Food poisoning caused by improper handling of ingredients. Property: This covers your business’s physical assets, from buildings to furnishings. It usually includes coverage for fire, natural disasters and theft. Spoilage: This covers any inventory that spoils in a power outage or similar mishap. Liquor liability: If you sell alcohol, this covers costs related to someone becoming intoxicated at your restaurant and hurting themselves or someone else. Workers compensation: This covers your employees’ medical treatment and lost wages if they get injured on the job. Garagekeepers: If you have a valet service, this covers damage to customers’ cars that may result. Boiler and machinery (equipment breakdown): This covers repair and replacement costs for your equipment under a wide variety of circumstances, including power surges and mechanical breakdowns. What Kind of Restaurant Insurance Do I Need? If you’re just starting out, a premade restaurant insurance plan might be the ideal choice for coverage. These policies can be convenient, cost-effective, and should offer the protection you need for the time being. Once you’re more established, you’re better off customizing your insurance, especially if you have expensive furnishings, appliances, or a fleet of catering vehicles. Premade plans might not have the proper protection to fully cover all your goodies. It depends on your restaurant’s sales and niche. In short, the more money you make, the more insurance will cost. Extra policies like liquor liability and garagekeepers insurance (if you have a valet service) will also add cost. Small restaurants and food stands: A few thousand dollars per year. Large, high-end restaurants: Potentially over ten thousand dollars per year. Chain restaurants: Premiums can vary, but will cost the most due to sheer numbers. Our agents will review your needs and help you evaluate the restaurant Insurance coverage that makes the most sense. They’ll also compare policies and quotes from multiple insurance companies to make sure you have the right protection in place. They'll hook you up — in a comprehensive and affordable way.